pollination syndromes « Nothing in Biology Makes Sense! 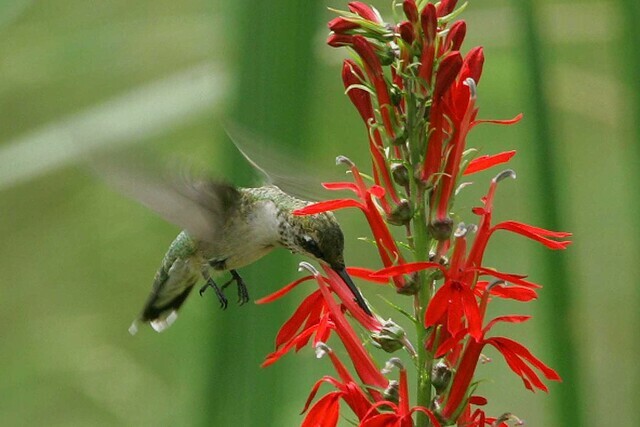 Want hummingbirds? Paint the town red. Photo by U.S. Fish and Wildlife Service Northeast Region. In my part of North America, spring is finally underway after a long slog of a winter. The trees lining the streets of my Minneapolis neighborhood are lacy-green with budding leaves, flowerbeds all over the University of Minnesota campus are yellow and red and pink with daffodils and tulips, and violets are popping up in the edges of lawns everywhere I look. Of course, all of this colorful display isn’t for my benefit. Showy flowers are an adaptation to attract animal pollinators. Some flowers are quite precisely matched to a single species of pollinator, but most flowers have lots of visitors. These less specialized flowers are still adapted for their attractive function, though—and this is the origin of pollination syndromes.